Police in Haiti have fired volleys of tear gas to break up a march by demonstrators calling for President Michel Martelly to step down and new elections to be held. An estimated 5,000 protesters marched through the city centre of the capital, Port-au-Prince, on Thursday, as some burned tyres and blocked streets. “First of all, I’m on the streets to give my support, my solidarity for the political prisoners who are in jail today, and also to call for the resignation of President Martelly,” said Rony Timothee, an opposition leader. 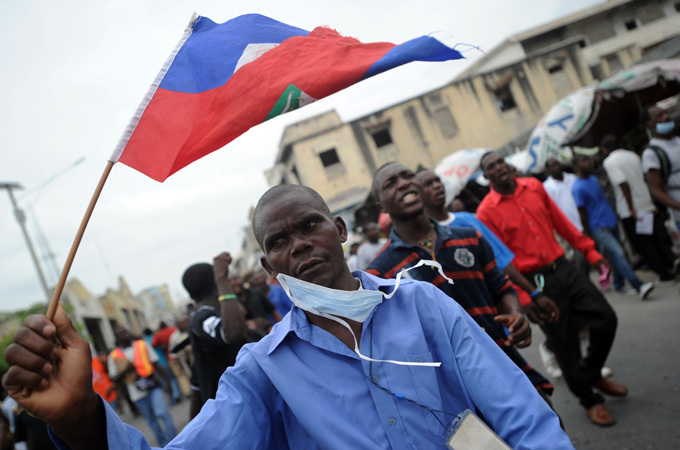 Protesters held signs calling on Canada, France, and the United States to “help Haitians get rid of the leaders in power”. There were no reports of serious injuries after police dispersed the crowds. Anti-government protests in Haiti have grown increasingly common in recent months. Protesters complain of widespread corruption in the government and the failure of Martelly’s administration to improve on jobs, schools and health care in the impoverished country. Martelly, who is midway through a six-year term, has accused his opponents of fomenting instability that discourages foreign investment and blocking legislation that would help the country. Legislative elections for about 100 members of the Chamber of Deputies, 20 senators and municipal leaders are set to take place on October 26 after multiple delays. But the various political parties are divided over the makeup of the electoral body, seen as subservient to the executive branch. The main opposition parties have rejected the deal setting up the polls, brokered by the first Haitian cardinal in the Catholic Church, Chibly Langlois. Martelly and a dozen senators met for two days to try to defuse the crisis but they failed to reach agreement on potential new leaders at the Provisional Electoral Council.